This place was originally the site of a large temple during the Silla Dynasty, but lay deserted for a long time. In 1689, the 15th year of King Sukjong during the middle Joseon Dynasty, the great Buddhist monk, Seonghae erected a temple and enshrined three Buddhist statues in it. 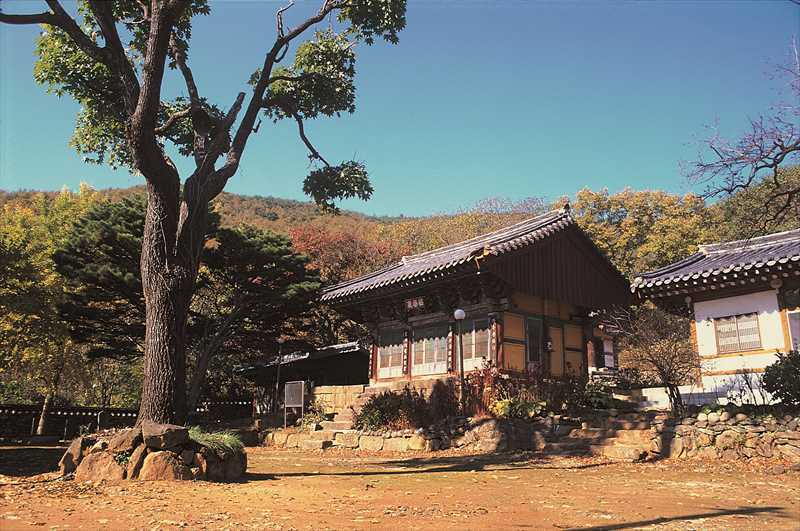 Geugnakjeon Hall is a building symbolizing the Buddhist paradise which is an utopia for Buddhists. The hall is a comparatively small gable-roofed building with three bays at the front and two bays at the side. However, brilliant brackets, dragon's head decoration and cloud-patterned carvings make the structure beautiful. The hall is estimated to have been decorated in this manner after the 18th century. Geugnakjeon Hall is designated as a treasure due not only to its architectural beauty but to the base platform of the building. Its stone embankment and stairs are decorated with carvings of crabs, turtles, dragons and lotus flowers. These patterns are unusual in Buddhist temples. The subjects of the patterns indicate that the embankment represents the sea, and suggest that the hall itself symbolizes the Banyayongseon (ship) sailing for the Buddhist paradise called Geugnak Jeongto. Geugnakjeon Hall with so many attractions is an important resource for studying Buddhist arts and architecture. The hall is 300m away (five minutes' walk) from Cheongdo Wine Tunnel.